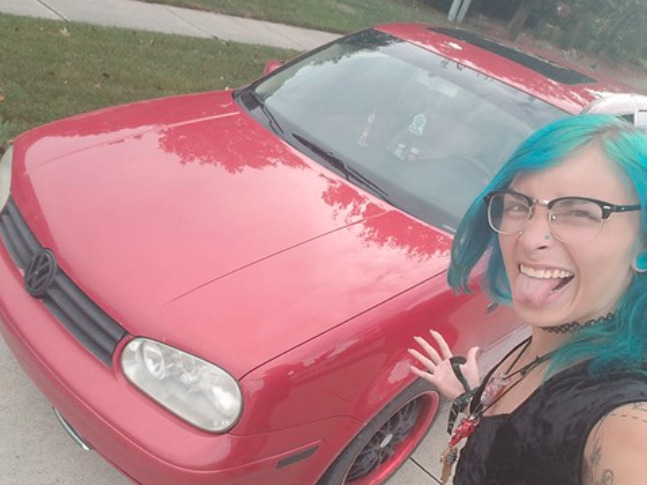 Rachel Marie, avid collector and "Rick and Morty" fan poses with a VW Golf she got for a single packet of McDonalds Szechuan sauce. After fans of the breakout Adult Swim hit show "Rick and Morty" flocked to McDonald's locations across the nation to get ahold of the Szechuan sauce discussed in the series, one diehard fan traded his car for a single packet of the sauce. Rachel Marie, a 23-year-old graphic designer from Michigan, woke up at 9 a.m. and headed to McDonald's with a friend to stand ninth in line for the limited edition sauce. But instead of slathering the sauce on a Big Mac or fries, Marie kept hers to see what she could get for it. Marie posted the sauce on Pin Nation, a Facebook group popular with festival goers and "Rick and Morty" fans where users can trade different pins and jewelry. "There was actually a large response with some nice pins," Marie told Business Insider. "But if I could get a car, I thought, why not ask?" Then a fellow fan who lived nearby offered up his early 2000s Volkswagen Golf Mk4. The fan, who did not give permission for his name to be used, and Marie said that they could not find and did not exchange the car's title, so Business Insider could not independently verify the claim, but both parties said they went through with the trade and photos were provided as evidence. The fan said he has another car that he will now fix up to use on a daily basis, but he told Business Insider via Facebook Messenger that he "just needed me some friggin sauce!!" Screenshots show how the deal went down. He isn't alone in paying a high price for the very limited edition sauce that cause some fans to fly into a fury when McDonald's ran out. On eBay, packets of the sauce are going for hundreds of dollars, but he probably paid the highest price as a good condition Golf can probably fetch around $2,000 even without a clean title. Also, McDonald's announced they would bring back the sauce, and lots of it, to McDonald's all over this winter. "This is the craze and it's insane" Marie said of the "Rick and Morty" fandom's love of sauce. Marie, who studies business in college, offered up some advice for fellow enterprising collectors looking to cash in to Business Insider on Facebook Messenger in the form of a hashtag: "#chasepapernotboys"